CONVERSABLE ECONOMIST: Should Voting be Compulsory? 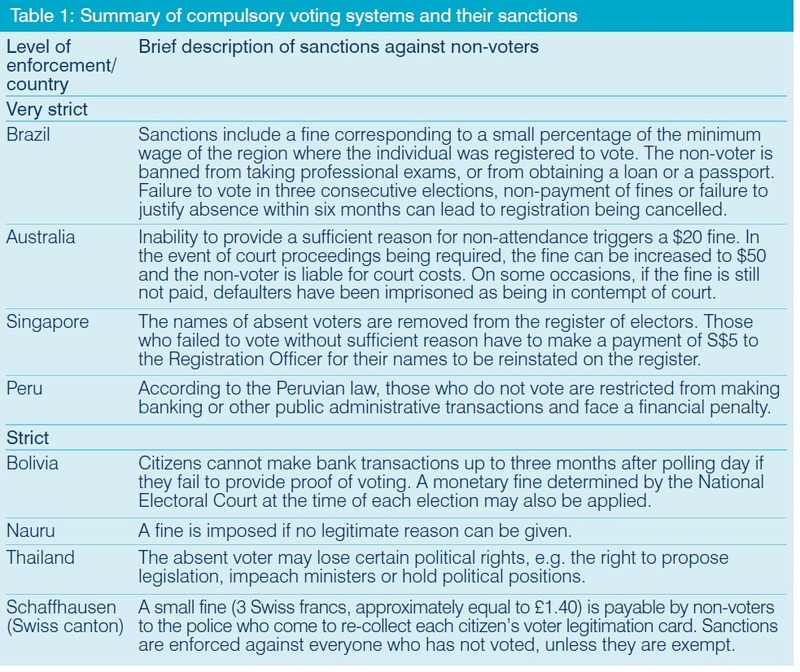 Just to put my cards face up on the table right here at the start, I'm not in favor of compulsory voting. But I think the case for doing so is stronger than commonly recognized. Let me lay out the arguments as I see them: low turnover, what the penalties look like in some other countries for not voting, the free speech/constitutional issues, and whether any resulting differences in outcomes would be desirable. The starting point for making it compulsory to vote begins with the (arguable) notion that democracy would be better-served if participation in elections was higher. 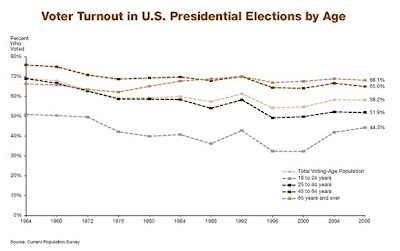 Here's a figure from a post of mine a couple of months ago on "Voter Turnout Since 1964." 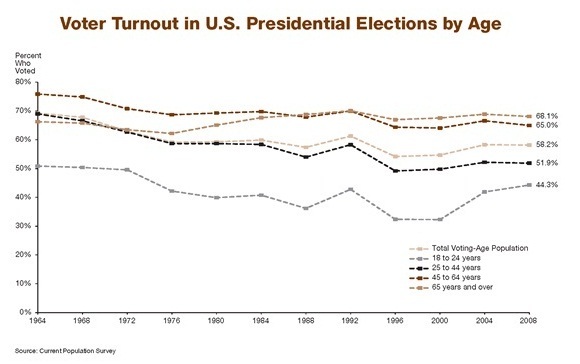 With some variation across age groups, voter turnout in presidential elections has been sagging over the last few decades. Some nations have responded to concerns over low voter turnout by passing laws that make it a requirement to vote. 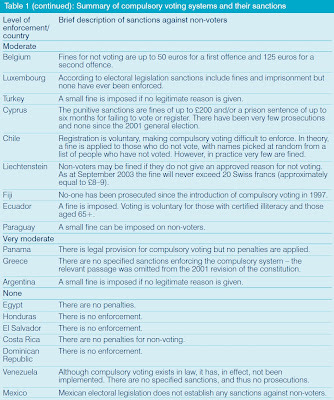 Here's a list of countries with such laws, and the penalties that they impose for not voting, taken from a June 2006 report from Britain's Electoral Commission. The penalties are categorized from "Very Strict" to "None." But honestly, even the "Very Strict" is not especially onerous. In talking with people on this subject, I've found that one immediate response is that that compulsory voting must be a violation of freedom of free speech in some way. I have some of this reaction myself. But while one may reasonably oppose the idea of compulsory voting, the case that it violates a specific law or constitutional right is difficult to make. Indeed, the original 1777 constitution of the state of Georgia specifically called for a potential penalty of five pounds for not voting--although it also allowed an exception for those with a good explanation. If the U.S. government can require you to pay money for taxes, or compel you to serve on jury duty, or institute a military draft, it probably has the power to require that you show up and vote. Of course, a compulsory voting law would almost certainly include provisions for conscientious objectors to voting, and you would be permitted to turn in a totally blank ballot if you wish. 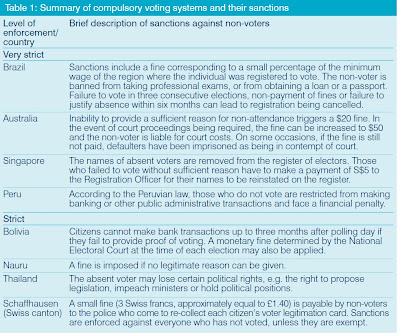 The penalties for not voting would be an inconvenience, but far from draconian. For a review of the various legal and constitutional ins and outs of compulsory voting, along with some of the practical arguments, I recommend this anonymous 2007 note in the Harvard Law Review, called "The Case for Compulsory Voting." 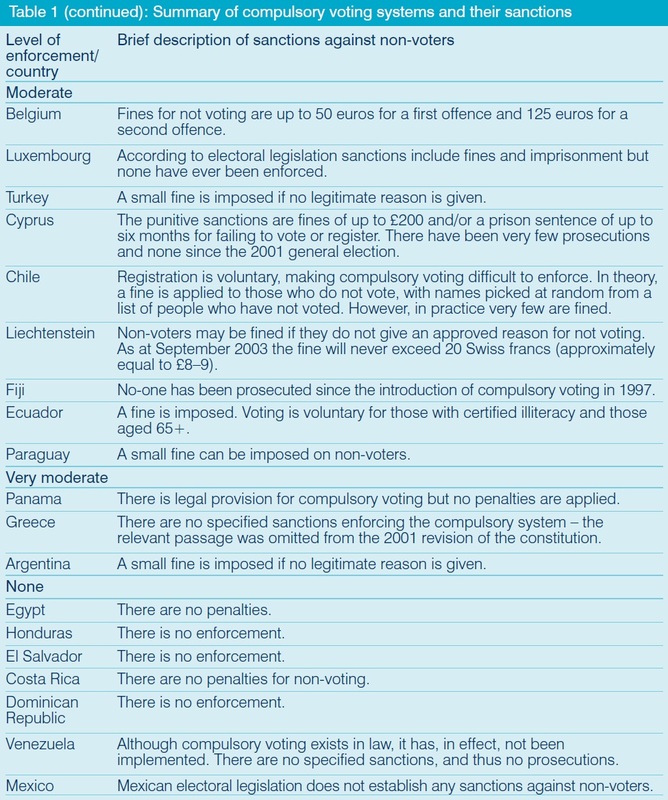 The author points out (footnotes omitted): "Approximately twenty-four nations have some kind of compulsory voting law, representing 17% of the world’s democratic nations. The effect of compulsory voting laws on voter turnout is substantial. Multivariate statistical analyses have shown that compulsory voting laws raise voter turnout by seven to sixteen percentage points." The anonymous author also offers what seem to me ultimately the two strongest arguments for compulsory voting. The first argument is that a larger turnout will (arguably) provide a more accurate representation of what the public wants, and in that sense will strengthen the bond between the electorate and its elected representatives. The second and more subtle argument is that compulsory voting would mean that political parties could focus much less on voter turnout. Less money and effort could go into turning out the vote, and more into persuasion. Those who now vote almost certainly have stronger partisan feelings, on average, than those who don't vote. So politicians aim their advertisements and strategies at that more partisan group. Many negative campaign ads attempt to reduce turnout for a candidate: if turnout was high, the usefulness of such negative ads could be diminished. A broader spectrum of voters would push candidates to offer a broader spectrum of messages to appeal to those voters, and groups that now have low turnout would find themselves equally courted by politicians. The question becomes whether these potential benefits to the democracy as a whole are worth the imposition of compulsory voting. The anonymous writer in the Harvard Law Review offers what is surely meant to be an attention-grabbing and paradoxical-sounding conclusion: "Although there are several legal obstacles to compulsory voting, none of them appear to be substantial enough to bar compulsory voting laws. ... The biggest obstacle to compulsory voting is the political reality that compulsory voting seems incompatible with many Americans’ notions of individual liberty. As with many other civic duties, however, voting is too important to be left to personal choice." How might one respond to these arguments? Perhaps the most obvious answer is that if one looks at the countries that have compulsory voting--say, Brazil, Australia, Peru, Thailand--it's not obvious that their politics are characterized by greater appeals to the nonpartisan middle, or that the bond between the population and its elected representatives is especially strong. For a more detailed deconstruction , I recommend a 2009 essay by Annabelle Lever in Public Reason magazine, "Is Compulsory Voting Justified?" Basically, her argument comes down to a belief that the potential gains from compulsory voting are unproven and unsupported by evidence in countries that have tried it, while the lost freedom from compulsory voting would be definite and real. In Lever's view, the evidence that exists doesn't show that political parties start competing for the middle in a different way, nor that outcomes are different. For example, northern European social democratic countries like Sweden don't have compulsory voting, and do have declining voter turnout. "I have argued that the case for compulsory voting is unproven. It is unproven because the claim that compulsion will have beneficial results rests on speculation about the way that nonvoters will vote if they are forced to vote, and there is considerable, and justified, controversy on this matter. Nor is it clear that compulsory voting is well-suited to combating those forms of low and unequal turnout that are, genuinely, troubling. On the contrary, it may make them worse by distracting politicians and voters from the task of combating persistent, damaging, and pervasive forms of unfreedom and inequality in our societies. "Moreover, I have argued, the idea that compulsory voting violates no significant rights or liberties is mistaken and is at odds with democratic ideas about the proper distribution of power and responsibility in a society. It is also at odds with concern for the politically inexperienced and alienated, which itself motivates the case for compulsion. Rights to abstain, to withhold assent, to refrain from making a statement, or from participating, may not be very glamorous, but can be nonetheless important for that. They are necessary to protect people from paternalist and authoritarian government, and from efforts to enlist them in the service of ideals that they do not share. Rights of non-participation, no less than rights of anonymous participation, enable the weak, timid and unpopular to protest in ways that feel safe and that are consistent with their sense of duty, as well as self-interest. ... People must, therefore, have rights to limit their participation in politics and, at the limit, to abstain, not simply because such rights can be crucial to prevent coercion by neighbours, family, employers or the state, but because they are necessary for people to decide what they are entitled to do, what they have a duty to do, and how best to act on their respective duties and rights." I don't know of any recent polls on how Americans feel about compulsory voting, but a 2004 poll by ABC News found 72% opposed--a slightly higher percentage than a poll taken 40 years earlier on the same subject. These kinds of results from nationally representative polls pose an additional level of irony. If Americans as a group are strongly opposed to laws that would require compulsory voting, it seems problematic to glide around this opposition into an argument that, really, although they don't know it yet, they would feel better off with compulsory voting. In a 2004 essay on compulsory voting (in this volume), Maria Gratschew points out that a number of countries in western Europe that used to have compulsory voting have have moved away from it in recent decades: Austria, Italy, Greece, and Netherlands. In discussing the decision by Netherlands to drop its compulsory voting laws in 1967, Gratschew writes: "A number of theoretical as well as practical arguments were put forward by the committee: for example, the right to vote is each citizen's individual right which he or she should be free to exercise or not; it is difficult to enforce sanctions against non-voters effectively; and party politics might be livelier if the parties had to attract the voters' attention, so that voter turnout would therefore reflect actual participation and interest in politics." Compulsory voting is one of those intriguing roads that looks better when not actually traveled.